I have flagrantly copied the format/layout of content from Brian Skalinder’s NJB3 FAQ and whataboutbob's iriver H1xx Tapers FAQ (thanks Brian and whataboutbob!). The data has been collected from various threads/comments here at taperssection.com. Please note that this is very much a beta version of the FAQ. I’m posting this because it's a great way to compile all known information on this topic into a single thread. Enormous THANKS goes out to poorlyconditioned for patiently answering a plethora of "n00b" questions from myself and others, as well as for introducing this alternative microphone powering method to this community. I'm a little confused about how this works, generally, much less specifics about the 3-wire powering. Where should I start? I've heard that 3-wire powering isn't very useful for taping. Is this true? What about taping quiet shows with 3-wire powering? The 3-wire powering method is a method of powering microphones, specifically the Audio Technica mics (AT831, AT853, AT933/AT943) as well as modified AKG ck9x mics or modified Nakamichi CM300s ("Franken Naks"). I think of it as a "pseudo-phantom" powering method. You can make fine recordings with the basic "2-wire" powering, and mask/prevent the distortion by using a bass rolloff filter. However, the Audtio Technica mics simply perform to more of their inherent potential with 3-wire powering, i.e. a 3-wire battery box or via phantom powering. I'm a little confused about how all this stuff works, generally, much less specifics about 3-wire powering. Where should I start? 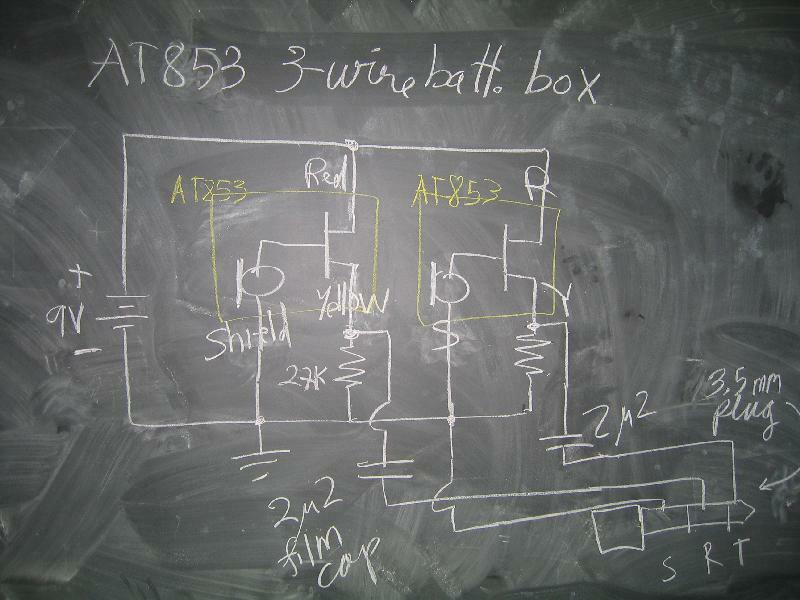 Below are several circuits/schematics. They're all basically the same, just presented differently. It depends on what you're recording. Using a 3-wire battery box isn't as needed if you only record acoustic and/or unamplified music. Also, if you run a phantom power supply unit (Denecke PS-2, etc.) then you already have the benefit of the mics handling higher SPLs without premature distortion. "Phantom power modules do two things: They give a low voltage (3 to 9V) to the electret elements, in 3-wire configuration. But also they provide a low impedance balanced output, using a transformer, or some transistor circuit. If you're doing long runs and/or you need to connect to an XLR mixer input, you want the phantom power. However, for us tapirs, we're probably running from our hat to our pocket, and we're probably running unbalanced lines anyway, so the [3-wire] batt. box is fine. For short wire runs and high impedance mic inputs they are identical. For longer runs, the AT/Samson adapters provide "buffering" or strengthening of the signal (via a transistor driving an output transformer). This provides a balanced and low impedance output. Balanced is good for long runs (>50' or so) and low impedance means you can drive any kind of input. Notably, you could put a step up tranformer there and drive a line input!" Thus, phantom powering is nice if you plan on using very long mic cable runs, or have a nice preamp you want to use with the mics (MP-2, UA-5, Sonosax, etc.). Two advantages of a 3-wire battery box are: 1) it's usually much smaller than any phantom power supply unit. (See pictures below, courtesy of a post by MLKLuke), and 2) this method does not require Samson PM4 or AT8533 power module adaptors (whereas phantom powering does require these modules). What about taping quiet shows, like acoustic or unamplified performances, with 3-wire powering? 1) Do nothing, i.e. just boost the levels in post. 2) Turn up the gain/recording levels on your recorder/preamp. 3) Buy/build a 3-wire preamp. 4) Use a dual miniXLR > mini-plug cable (a.k.a. "Y-cable"), and run the mics on plug-in power from the recorder, or with a standard 2-wire battery box.